I am doing some writing on post-conflict elections and democratization based on separate field studies in Nepal and Liberia. I created this graph to provide some context for the research. I used the UCDP Armed Conflicts dataset (link) to identify post-conflict “peace spells” in the period of 1990 to 2009. These peace spells are defined as periods of peace after ceasefires or peace agreements in civil wars and other types of intra-state armed conflict. I then added to these post-conflict peace spells Polity scores from the Quality of Governance dataset (link). (We should all take a moment to pay respect to the Swedish taxpayer, whose dollars allow such seminal datasets to be created and maintained!) The Polity score runs from -10 to 10 and measures a polity’s progress from autocracy (-10) to democracy (10). I modified these scores such that if a peace spell ended in a resumption of armed conflict, the year of resumption was coded as a -10, and then the time series was terminated. 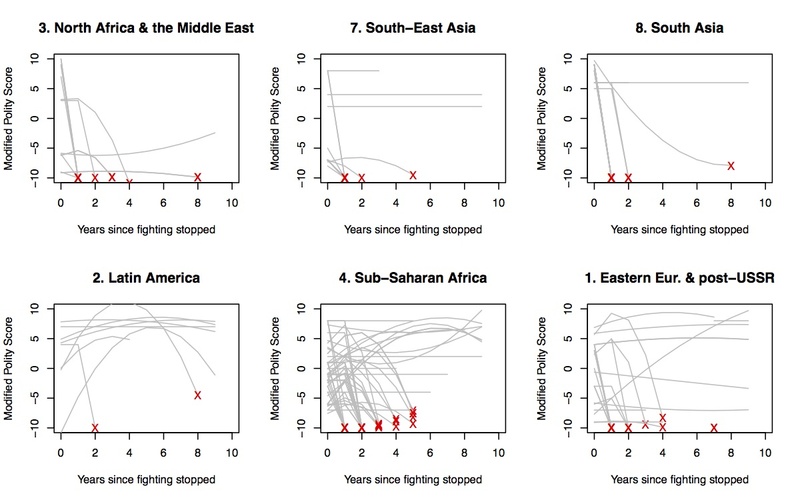 The x-axis plots years into the post-conflict peace spell, and the y-axis plots the modified Polity scores. The trajectories are smoothed (using a quadratic fit) to make them easier to read. The red X’s show a resumption of armed internal conflict. If a line ends before 10 years without a red X appearing, that means that it has come up against the last year recorded in the data (2009). Breaking things out by region like this allows one to see the remarkable success of Latin American cases in going from armed conflict to democracy. It stands far apart from the other regions. The density of activity for sub-Saharan Africa reflects the extent to which the continent has endured armed political strife over the past two decades. At the same time, we see dramatic heterogeneity in the political dynamics that unfold after fighting stops. This entry was posted in Uncategorized on October 4, 2012 by Cyrus.